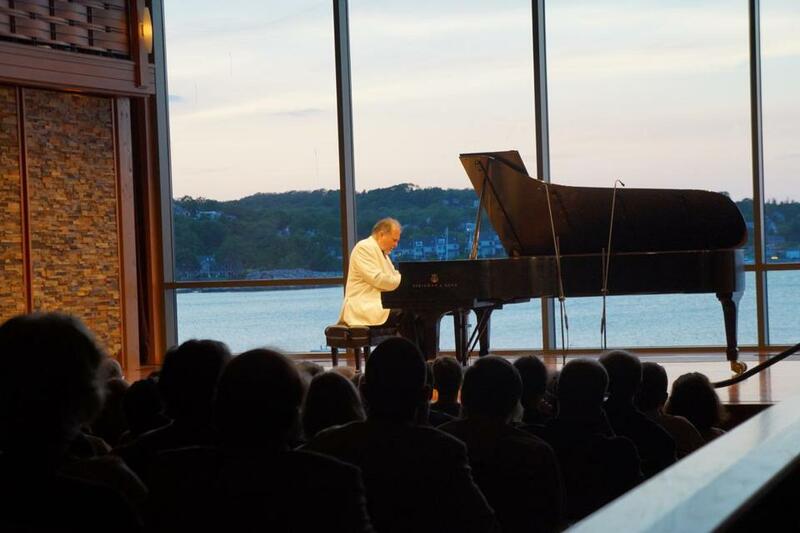 Pianist Garrick Ohlsson onstage Thursday at the Shalin Liu Performance Center in Rockport. ROCKPORT — Garrick Ohlsson takes up space. The internationally acclaimed pianist takes up space in the physical sense, standing 6 feet 4 inches tall, with hands that can cover vast intervals seemingly without a stretch. He deliberately spreads his mind through the piano repertoire and has since the beginning of his career, bucking a manager’s suggestion that he stick to Chopin, whose work launched him to fame. And he took up temporal space Thursday evening, slowly seating himself at the Steinway grand on the stage of the Shalin Liu Performance Center, letting silence bloom before placing fingers to keys. Considering all this, it was surprising to hear as the first piece such a downcast, labored rendition of Schubert’s Piano Sonata No. 14 in A Minor. Chords were blocky and bright in the opening Allegro giusto movement, each falling like a stone. He briefly let it rip near the halfway point, left hand stampeding down the keyboard, before returning to the same weightiness. The Andante trudged, as if overwhelmed by sheer angst. The third movement picked up more vitality, with streams of scales moving in counter motion, and the stage was set. A selection of short pieces by Scriabin burned away the lingering clouds with cosmic chromaticism. In the first piece, one of the composer’s later works, octaves and minor ninths twinkled like distant stars over an undulating, rolling left hand. From there, Ohlsson plunged back in time from the composer’s most outré repertoire into a swooning, Romantic-style etude, taking the audience on a tour through Scriabin’s unique world that ended with an entrancing Sonata No. 5. The piece demanded bravura in cascades of chords and spritzing flourishes, and the performer delivered, finishing with a run up the keyboard that left him facing the audience for a bevy of cheers. After intermission, Ohlsson played Schubert’s Piano Sonata No. 20 in A Major with clean, simple lines and sparing use of the sustain pedal. He stumbled a few times on the music, but did not lose his composure when a heavy program book plummeted from the balcony to the aisle below. The Scherzo was picturesque and well mannered, with a few stormy moments for texture, and the final movement emphasized lyricism through every complex variation, emphasizing the songlike contour of the primary theme. He held the final note for an eternal few seconds, savoring the space that had been offered him, returning without hesitation for ovations and an encore. Presented as part of the Rockport Chamber Music Festival. At Shalin Liu Performance Center, Rockport, July 6.